There is little doubt that the first team to be founded in the capital was that of the Malta Athletic Club, some time around 1886. We know for certain that on November 15, 1886, they played against the students of St Ignatius College at the Blue Ditch in Porte des Bombes. The Valletta team won that match 5-0. The Malta Athletic Club was a gentlemen's club, which had Maltese and English people enrolled as members. In 1896 they had premises at 289, Strada San Paolo. In 1911, when they were probably re-founded after a break of some seasons, they moved to the Grand Studio in Strada Reale. The Malta AC was responsible for promoting various sporting disciplines and, apart from football, they introduced cricket and roller skating. 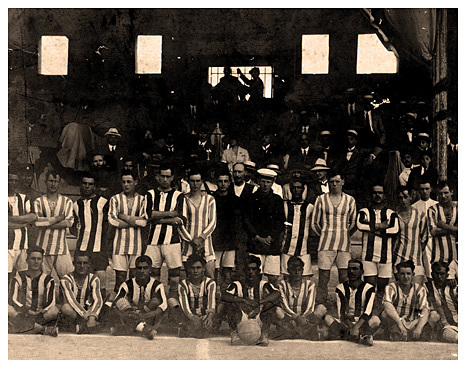 In 1911-12, they organised the Second Civilian Football League and in 1913 they formed the Melita FA. Later on, this association amalgamated with the Malta FA (which had been formed in 1910 at the University) to form one national association. St George's Square were founded sometime between 1901 and 1904. They earned their name because they were formed in a wine-shop in St George's Square in front of the Main Guard. In those days this square was named Piazza San Giorgio. Some claim that the team was established well before this date but there is no evidence to support this theory. From the scant records which exist we know for certain that St George's Square FC played against the Drummers of the Royal West Kent Regiment on March 31, 1906 winning a high-scoring match 5-2 at Marsa in a blistering wind. The Maltese team took advantage of the conditions in the first half scoring no fewer than five goals. In the second half, with the wind against them, they were forced to defend allowing the soldiers to pull back two goals. St George's played with the following formation: A. Consiglio, J. Bonello, P. Cardona, H. Gatt, P. Saliba, E. Gatt, L .Inglott, J. Falzon, L. Dimech, O. Azzopardi, A. Naudi.